Open ImgBurn and choose Mode -> Build, or use the Ctrl+Alt+B option. This opens Build Mode and you will see this screen. From here, you can add/remove files or folders to your ISO. You can choose to type the folder location in the drop down box, or browse for files/folders via the icons on the right. 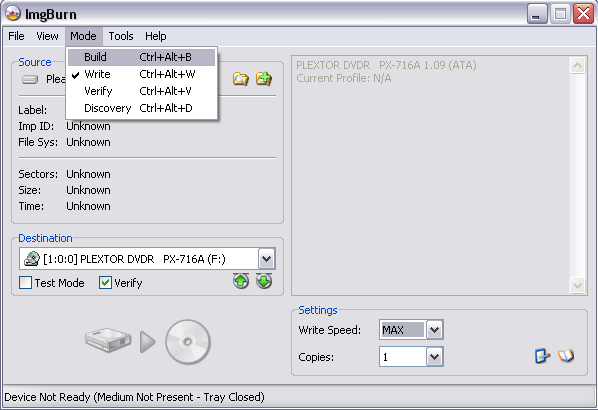 By pressing the disc icon, highlighted in the red box, you can choose the Output mode to save your ISO. This Output mode is save to hard disc. You need to choose a destination folder on one of your hard discs. 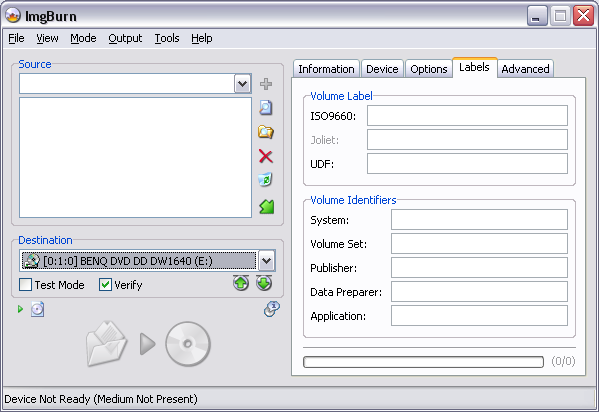 As you change between save to CD/DVD and Save to Hard Disc, the Device tab is no longer shown on the GUI. You can choose to change the Output at the top of the GUI if you prefer . 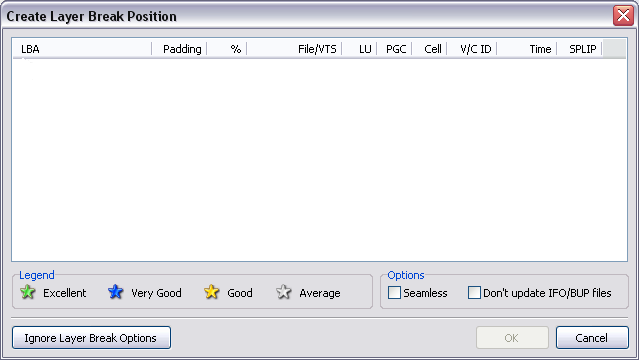 As you add files/folders, you can check the size of the ISO by pressing the Calculator. It will indicate the size of the disc you need as you build. Check the 'Auto' checkbox and this will be done automatically as you add files/folders to the list. From the Options tab you can choose the file system you wish to use. 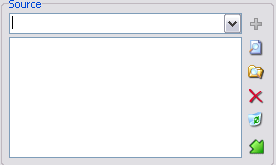 Choose the file system you wish to use from the dropdown. ISO9660 is the original one that's been around for years and has quite limited functionality. You're limited to all uppercase file names. You're limited to file less than 4GB in size. Joliet is an extension of ISO9660 and allows for longer / mixed case file names. The file size limit still applies. For Joliet to be used, ISO9660 must also be present - this is reflected in the options available. UDF is a file system in it's own right and does not depend on another one also being present. 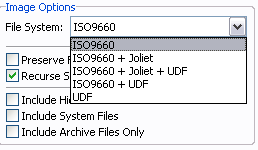 UDF supports long / mixed case file names and does NOT have the 4GB file size limit of Joliet and ISO9660. It is the 'better' option for those people using up-to-date operating system. I say 'up-to-date' because older ones like Windows 95 and 98 cannot read / understand the UDF file system and will probably report the disc as being corrupt if that's the only one on it. Standalone DVD players are only supposed to (made to) understand UDF. Being able to read ISO9660 / Joliet is optional. 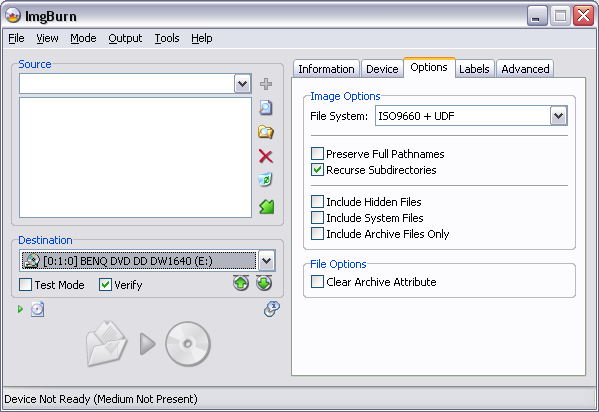 As such, if you're building a DVD Video disc, you at least want to make sure the UDF filesystem is present in any image you're building / burning. A typical DVD Video disc you buy from a shop will use 'ISO9660 + UDF', so to be totally correct, that's what you should use too. That way, a standalone player can read it (due to UDF) and PC's with old operating systems can read it (due to ISO9660). A new operating system can read both but will favour UDF because it's more advanced. 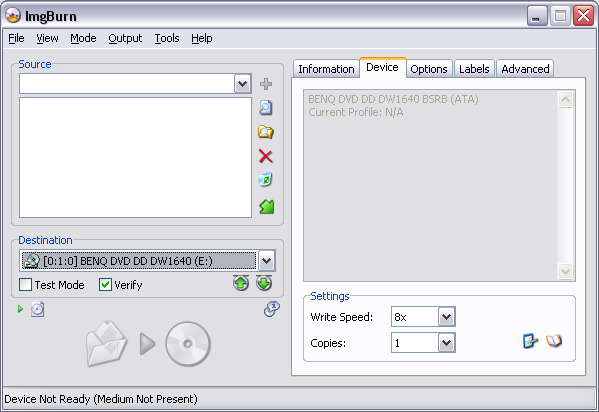 If you are using ImgBurn's Build Mode to make Double Layer DVD Video discs, during the build you will see this window. There is a rating system at the bottom which indicates the best Layer Break choice. Where you have multiple options showing the same LBA address, these just represent Cells that are reused in various PGC's. It's quite possible for each of these entries to be given a different rating, so you may have to think a little bit and average the options out. i.e. if you have a single 'Very Good' entry and then 5 with the same LBA where 1 is ranked as 'Excellent' and the other 4 are 'Average', go for the 'Very Good' entry on its own. From the Labels tab you can give your iso the name you want it to have. These fields are used to fill out certain structures within the filesystem. Their content is almost never seen and what you put in them has no real effect on anything. Typically you'd just leave them blank. The progress bar is updated so that it represents the number of characters you've typed in, and how many the field actually allows for. The text colour changes from green to orange to red as you start to run out of available characters. 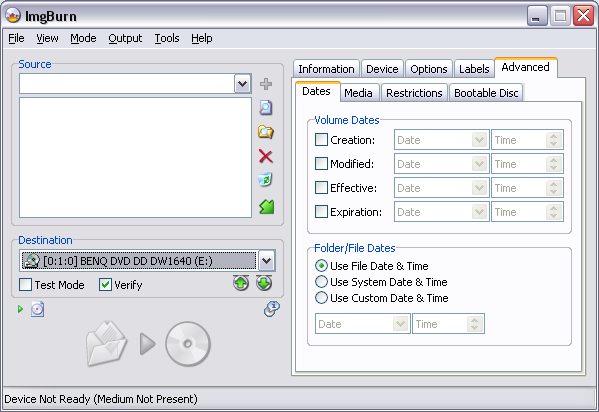 Here you can adjust / override the dates and time associated with files and folders. You can also set the dates / times associated with the image as a whole. If no date / time is specified, it will typically use the current system time - unless otherwise specified - i.e. where it says it'll use the existing file time. The dates and times of files are what you see in explorer when you look at the created / modified dates and times. To override the default values, just check (tick) the checkbox, select the date from the calendar control and the time from the time control (you need to actually type numbers into that one). This applies to those people building to an ISO image rather than burning on the fly to a disc. When burning to a disc, these values are retrieved from the media in the drive and certain assumptions are made based upon it's format (i.e. 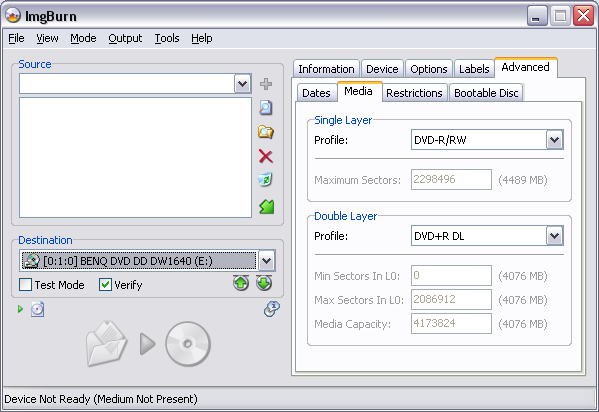 double layer or single layer, dvd+r or dvd-r etc). 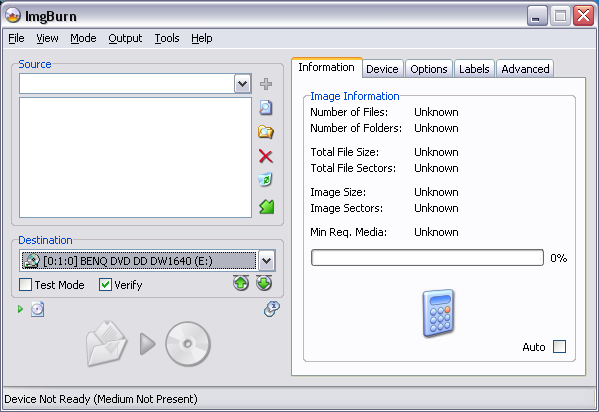 When you're building an ISO image, the program needs to know the maximum amount of data (sectors) you want in the image before the program should consider it a 'double layer' image and start looking for layer breaks and stuff (* if it's a DVD Video style image). The profiles can be used to take a standard value for either DVD-R or DVD+R format media. If you want to enter your own value (i.e. if you like to overburn), select Custom and type it in manually. When the amount of data in your image exceeds the 'Single Layer - Maximum Sectors' value, the 'Double Layer' values come into play. You need to ensure the correct profile is (or custom values are) selected here so that your image is built correctly for the discs you intend to burn to. All file systems have their limitations. Sometimes these can be 'tweaked' slightly to suit your needs. The 'Level X' values are where allowable lengths are taken to the extreme and represent the maximum values possible. There is no guarantee the images produced using 'Level X' relaxed restrictions will be readable. 'Allow Full ASCII Character Set' can be used to override the ISO9660 limitation of only allowing 'A...Z', '0...9' and '_' characters in file names. 'Don't Add ';1' Version Number To Files' can be used to ImgBurn to go against the ISO9660 specifications and not append ';1' to the end of all file names. I honestly have no idea where this would be useful, but other burning tools include the option and so I'll just go along with them! Make Image Bootable can be checked if you want to make a bootable image. That's to say, one that you can have boot up in the same fashion a bootable floppy disc does, before the operating system kicks in. This type of feature is typically seen on recovery discs and will often be used by those people who choose not to have a floppy drive installed in their new PC. Once enabled, select the emulation type for the boot image you've already prepared. So for example, if you've created your image by reading a bootable floppy disc, you'd probably select '1.44Mb Floppy Disc'. You then point 'Boot Image' at your bootable image file. (This can be created via the method explained below). 'Create Boot Image' can be used to read a bootable floppy disc to an image, or extract an existing boot image from a bootable CD. You just need to select the source drive and then click on the picture of the floppy disc. It'll ask you for a name for the image and then start creating it. It's is this type of image that the above mentioned 'Boot Image' option would point to.